Southend manager Phil Brown was was delighted that his ‘surprise tactics’ earned his side a much-needed point at Peterborough United yesterday (January 16). Brown fielded a very negative line-up in an attempt to stifle Posh’s attacking style. It worked perfectly as Southend picked up a 0-0 draw at the ABAX Stadium, although it needed a last-minute penalty save from visiting goalkeeper Dan Bentley Dan Bentley to preserve the clean sheet. 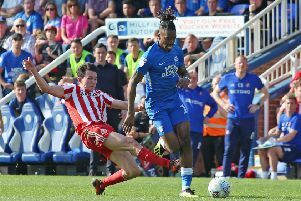 Brown was fuming at that decision after Posh substitute Marcus Maddison went tumbling following a challenge by Southend central defender Adam Thompson. Assistant referee Matthew Buonassisi flagged instantly in Maddison’s favour to the surprise of most onlookers. And Brown’s mood didn’t alter despite Bentley’s heroics. Brown said: “That’s the closest in 36 years I’ve seen to anybody cheating. I’ll stand by what I said and if that costs me then it costs me. “It’s not the linesman’s job to flag like that for a penalty,” Brown blasted. “He’s backed the referee into a corner and it could’ve cost us. “Justice was done, but we had a few opportunities too. On the balance of play we deserved a point. “Our expectation three games ago was to get in the play-offs and it still is. “Peterborough are a side that has scored 52 goals this season. They play open and attractive football and we had to come here with a game plan to stop that and I think we did. Brown’s opinion of the spot-kick was backed-up by Bentley. He said: “Tommo (Adam Thompson) clearly got the ball. It went in the opposite direction to the player and it was a very poor decision. The 0-0 draw ended a run of three straight defeats for a Southend side who had conceded 11 goals in that run. Southend are eighth in League One, three points behind Posh who occupy the final play-off place.